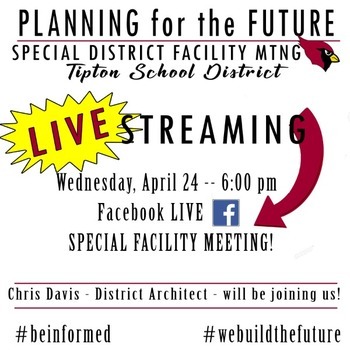 Next Wednesday, April 24, at 6 pm, the Board of Education will host a facility meeting about a possible bond issue to be brought before the voters in 2020. They will be discussing the needs of the Tipton R-VI School District. 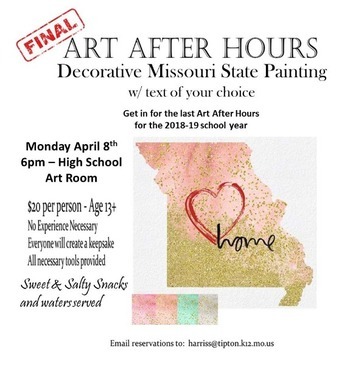 The District's architect, Chris Davis, will be presenting information on the cost of projects for the districts needs, as well as their wants. The board of education would like to make sure the community is well informed before this bond issue comes to voters. All community members are welcome to join this meeting at 6 pm in the elementary gym. If you are unable to attend, they will be streaming the meeting live through Facebook.